KARACHI: Pakistan Peoples Party leader and former chairman of the Senate Senator Mian Raza Rabbani has said that Prime Minister Shahid Khaqan Abbasi’s tax amnesty scheme is aimed at facilitating big business, capitalists and elite class to whiten their black money. “We reject this scheme because introduction of the amnesty scheme by the government at a time when it has only 55 days to complete its constitutional term is beyond comprehension,” he said. Speaking at a press conference at Qasr-i-Naz here on Friday, Mr Rabbani urged the opposition parties in the Senate to table a resolution to reject the amnesty scheme. The prime minister had announced a popular economic reforms package, including the amnesty scheme, at a press conference after a meeting of the Economic Advisory Council in Islamabad on Thursday. He had said that only 700,000 people paid taxes in the country and the package would bring more people to the tax net and provide an opportunity to those having undeclared assets at home and abroad to whiten their assets after paying two per cent penalty. Terming the amnesty scheme a hasty decision, Senator Rabbani said that it was surprising that the government had taken such a major decision without approval from any constitutional forum, except the so-called Economic Advisory Council, which had no legal status as a majority of its members were not elected representatives of people. The PPP leader said when both the houses of parliament were about to meet, the government should have brought the amnesty scheme to parliament to get its approval. 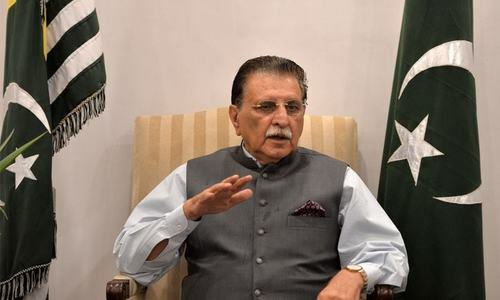 Therefore, he said, “I request President Mamnoon Hussain to refuse to approve the amnesty scheme because it violates Article 77 of the Constitution and is aimed at facilitating big businesses to bring money illegally taken abroad back to the country by paying nominal taxes”. Mr Rabbani regretted that the government introduced only such schemes which benefited capitalists while it failed to launch any scheme to provide relief to the poor and middle class who were left to suffer from price hike. The PPP leader said that Pakistan was a signatory of the UN Convention Against Corruption and the amnesty scheme would violate the convention. He said that if the scheme was introduced through an ordinance, he would propose to the opposition parties in the Senate to unite to reject the ordinance. However, the PPP leader said, before tabling a resolution in parliament to reject the ordinance, they would seek approval of the resolution from their parliamentary party. He also asked the business community to raise its voice against the scheme because it was not going to increase foreign exchange. Replying to a question, he said that the act of introducing the scheme through an ordinance would bypass parliament. Moreover, even the amnesty scheme had not been approved by the federal cabinet and as such it was a violation of the Article 77 of the Constitution, he added. In response to another question, Senator Rabbani said that political issues should be resolved in parliament and must not be taken to courts. To yet another question, he said that the prime minister’s assertion that no presiding officer could call him to the Senate was wrong because the federal cabinet was accountable to the upper house of parliament.